The Big 10 athletic conference is a group of schools participating in the National Collegiate Athletic Association’s (NCAA) Division I program. Division I schools are the best of the best with the largest number of student athletes, most diverse athletic programs and largest athletics budgets. The Big 10 is the oldest conference in the US having been founded in 1896. Today, the conference consists of fourteen members schools, mostly located in the Midwest. Rutgers University, the University of Maryland and the University of Nebraska are the newest members who joined in the early 2010’s. Most of the schools are large public research institutions although there are a few exceptions. Want to go to a big sports school and get a great quality education? Keep reading for College Factual’s ranking of the Big 10 schools according to their overall quality ranking. When it comes to academics and athletics, Northwestern is a combo hard to beat. CollegeFactual ranks Northwestern University as the best Big 10 School in the conference and #10 overall in the nation. Northwestern is the lone private school on this list and has a large population of postgraduate students. With about 21,000 students combined, over 12,000 are postgraduates. Northwestern has 19 intercollegiate teams consisting of 8 men and 11 women’s programs. Top ranked men’s sports include basketball (#3) and football (#8). Top women’s sports include soccer (#3) and golf (#3). Northwestern holds a total of 8 total team championships. Northwestern has a Learfield score of 550 and has annual sports related revenue of $61 million. The University of Michigan is a large public research university with about 29,000 undergraduate students. The school is impressively ranked #38 in the nation for overall quality and #2 on our list of top Big 10 schools. The University of Michigan competes in 29 sports split across 14 men’s and 15 women’s sports. Top ranked men’s sports include football (#2), gymnastics (#3) and indoor track and field (#5). Top ranked women’s sports include rowing (#2) and water polo (#5). The school has racked up a total of 35 team championships making it #18 in the nation. With a Learfield score of 1138, and sports related annual revenue over $128 million the University of Michigan takes sports quite seriously. The University of Illinois at Urbana-Campaign is a large public school with a large undergraduate population of nearly 34,000 students. While a smaller program than the massive University of Michigan, Illinois still fields 17 sports across 8 men’s and 9 women’s programs. Top ranked sports include women’s softball (#25), men’s gymnastics (#2), men’s golf (#4) and wrestling (#4). 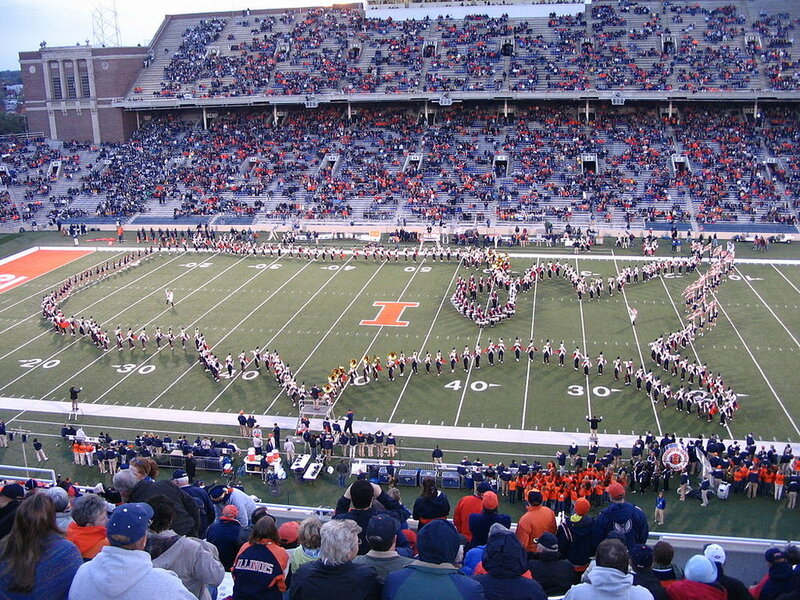 Illinois has a Learfield score of 662 and annual sports revenues of over $63 million. The school holds a total of 18 team championship titles. Illinois is ranked #74 in overall quality. The University of Wisconsin Madison (UW) is a large university with over 30,000 undergraduates. UW is ranked #82 in the nation for overall quality and #1 in the state of Wisconsin. The school has a robust athletics program and hosts 22 sports split evenly between 11 men and women’s teams. It may be hard to believe, but in a place where frozen water is abundant in the winter, UW’s top ranked sports are for both men and women’s hockey - #3 and #1 in the nation respectively. UW has a Learfield score of 672 and pull in revenues of over $100 million each year. UW has won a total of 28 team championship titles. The University of Maryland (UMD) at College Park is located on the outskirts of Washington, DC and is home to over 28,000 undergraduate students. UMD is ranked #102 in terms of overall college quality as ranked by College Factual. UMD has a Learfield score of 503 and has annual sports related revenues of over $62 million. The school competes with 22 sports split across 10 men’s and 12 women’s sports. Top sports include men’s lacrosse (#5) and women’s lacrosse (#2). The total number of team championships won for this Division I school is 29. Purdue University is located in West Lafayette, Indiana has a large undergraduate population of over 31,000 students. The school has a Learfield score of 518 and annual revenues of over $70 million. Teams compete in 18 sports split across 8 men’s and 10 women’s. Purdue holds a total of 3 team championship titles. Top ranked sports include men’s basketball (#19) and women’s volleyball (#45). The University of Minnesota (UMN) – Twin Cities campus is nestled between the cities of Minneapolis and St. Paul. The school has a large undergraduate population of over 34,000 students. UMN has a Learfield score of 819 and has annual sports related revenues of over $83 million. The school fields teams for 23 sports including 11 men’s and 12 women’s teams. Top ranked men’s sports include baseball (#32) and ice hockey (#5). Top ranked women’s sports include softball (#20) and volleyball (#37). UMN has a total of 19 team championship titles and ranks #135 in overall quality. Michigan State University – not to be confused with its sister in Ann Arbor – is a large university with over 39,000 undergraduates located in East Lansing, Michigan. College Factual ranks Michigan State #140 for the top colleges in the US. This school has a robust athletics program fielding 21 sports; 10 men’s sports and 11 women’s. MSU has a Learfield score of 670 and annual revenues of over $79 million. Top ranked sports include men’s basketball (#24), baseball (#48) and women’s basketball (#66) and softball (#55). Michigan State has a total of 20 team championships. Rutgers University is located in New Brunswick, New Jersey and is one of the few Big 10 schools to be located out of the Midwest. Rutgers is ranked #142 in overall quality and has a large student population of over 36,000 students. Although Rutgers has a relatively large athletics program with 20 competitive sports and over $57 million in sports related revenue, the school has a low Learfield score of 134.5. Top ranked men’s sports include lacrosse (#9) and basketball (#88). Top ranked women’s sports include soccer (#46) and basketball (#108). Rutgers holds one NCAA Division I team championship for fencing. The University of Iowa is located in the mid-size town of Iowa City and has approximately 24,000 undergraduate students. The university has a large athletics program and brings in over $97 million in sports related revenues. Students compete in 22 sports split across 11 men and 11 women’s sports. Top ranked men’s sports include wrestling (#1 in the nation) and baseball (#33). Top ranked women’s sports include basketball (#63) and volleyball (#72). Iowa has a total of 25 team championships – an impressive 23 were from wrestling. Indiana University is located in Bloomington, Indiana and is a large public school with over 39,000 undergraduate students. College Factual ranks this school #172 in overall quality. Indiana has a large athletics program consisting of 24 sports across 11 men’s and 13 women’s sports. The school has a Learfield score of 652 and a total of 24 team championships. Top ranked sports include men’s basketball (#36) and soccer (#14) while top ranked women’s sports include basketball (#52) and volleyball (#89). 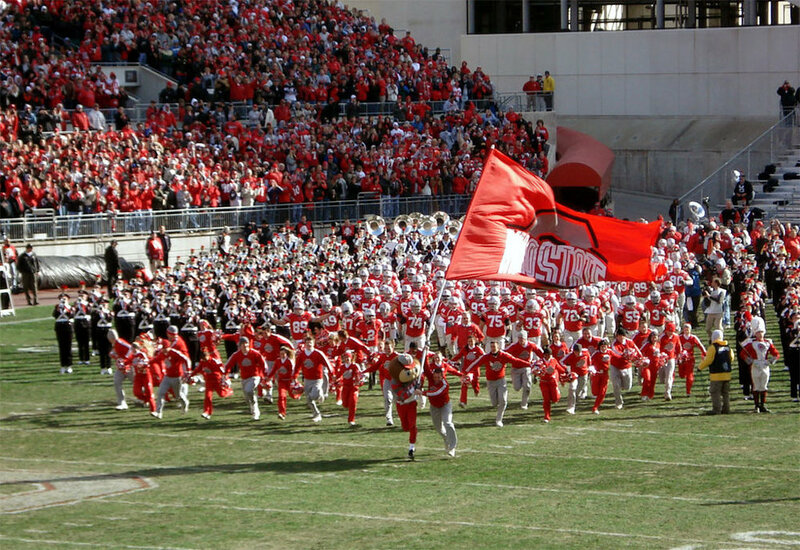 The largest school on this list, Ohio State has over 45,000 undergraduate students. It’s not hard to believe Ohio State’s athletics program is pretty popular with over $142 million in sports related revenue. Thirty sports are fielded across 15 men and 15 women’s sports. Top ranked sports include men’s volleyball (#1 in the nation) and football (#6) along with women’s basketball (#23) and volleyball (#51). An impressive 30 team championships are held by Ohio state. The school has a Learfield score of 868. Like other large public universities in the Midwest, the University of Nebraska-Lincoln (UNL) has a large undergraduate population of over 20,000 students. UNL is ranked #300 in overall quality and has a Learfield score of 772. UNL fields 21 sports teams and has annual sports related revenues of over $81 million. Top ranked sports include men’s basketball (#120) and baseball (#46). Top ranked women’s sports include volleyball (#6) and soccer (#94). 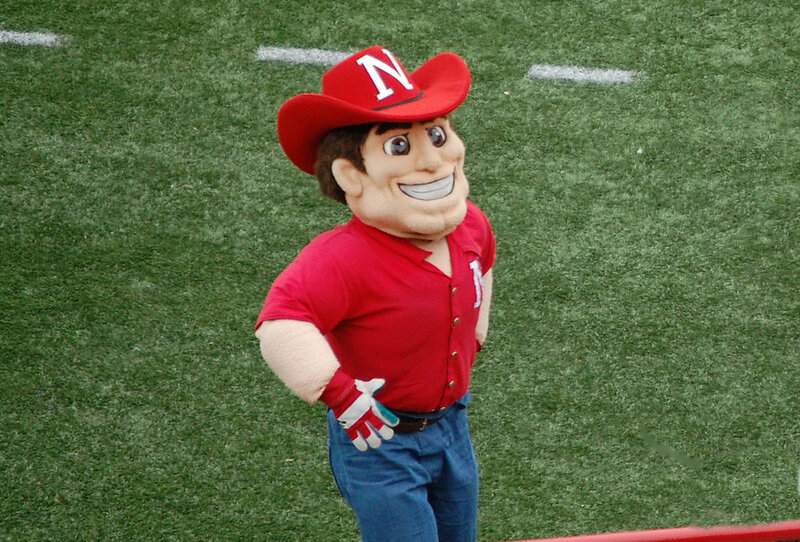 UNL has a total of 20 team championships. Pennsylvania State University – usually referred to as Penn State is a large public university with a student body of over 41,000 students. With a large student population comes a large athletics program. Penn State has 27 sports split across 14 men’s and 13 women’s sports and brings in over $100 million in sports related revenue. Top ranked men’s sports include football (#9) and basketball (#90). Top ranked women’s sports include volleyball (#27) and soccer (#44). Penn State has an impressive total team championship wins of 50 and a high Learfield score of 1100. Penn State is ranked #162 in the nation for overall quality. Which of these schools is right for you? Sign up for your free College Factual account to find out which schools fit you best academically, financially and socially.